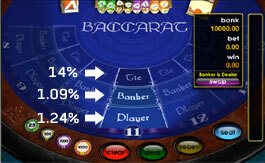 The common lowest possible house edge in the game of Baccarat is 1.09%. The house edge varies in Baccarat depending on whether you bet on the banker's hand, the player's hand or on tie. To reduce the house edge in Baccarat to as low as possible in a standard game, always bet on the banker's hand. The bankers hand gives a house edge of 1.09%, whereas the the player's hand gives a house edge of 1.24%. Betting on tie gives the house a whopping 14% advantage. Therefore the obvious option to reduce the house edge in Baccarat is to bet on the banker's hand at all times, and avoid betting on tie. It is important to note that if you win whilst betting on the banker's hand, 5% commission goes to the house. For example, if you bet $1,000 on the bankers hand and win, you will receive $950 in winnings as opposed to $1,000 in winnings if you bet on the player's hand and win. Even with this marginally reduced win when betting on the banker's hand, it still makes it a better choice to bet on the banker's hand over betting on the player's hand. There is no real strategy in Baccarat to help you improve your chances of winning. Whereas in high limit Blackjack you have a choice of what actions to take after being dealt your hand, after you hit the deal button in Baccarat it is all down to the cards. Baccarat is quite like a glorified version of betting on the toss of a coin, except for the fact that the house has that little extra chance of winning. The house advantage is low when compared to the house edge of Casino games, which makes it a popular choice for high rollers. The house edge makes Baccarat a popular game with the high rollers, which is why many Casinos offer high limit Baccarat games, even though the game is pretty straightforward with no real strategy involved. Pinnacle Casino is my top choice for high stakes Baccarat, as you are able to bet up to $5,000 per hand, which is a lot higher than the next best option of Ladbrokes. The software at Pinnacle also runs very smoothly, which makes the Baccarat game there a pleasure to play.